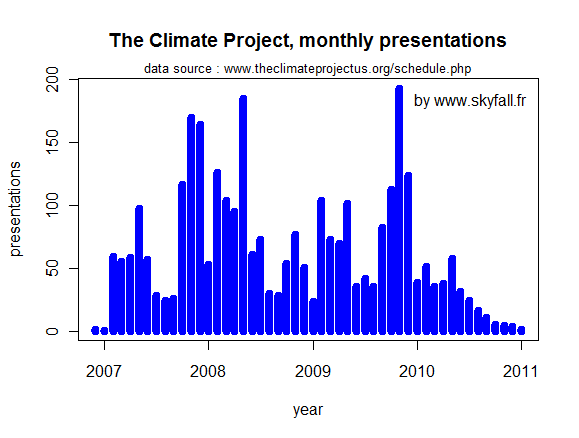 Another “unprecedented” decline due to Climategate | Watts Up With That? It seems not a lot of people are interested in paying 100,000 dollars to hear Al Gore speak anymore. Or even to have some of the trained presenters do it for free. Yeah, it doesn’t look good for them, down 70% of an already minuscule market share in the last month. They didn’t even get much of a Climategate bump. I’d call it “flatlining”. This reminds me to remind you that WUWT succeeds via linkage. So please link to WUWT whenever you can in comments and encourage news articles and blog posts from content here. Also, thanks to WUWT reader Marcos José for the tip on the bookings and to reader Eduardo Ferreyra the translation. I think most of the atendees deserve a refund, even the ones that attended the free presentations. Poor Al, he didn’t get to be President and now this. Maybe he can try his hand at infomercials. Has happened to all the ice! Hide the decline of dog and pony shows. I’ve never seen AIT and wouldn’t pay ten cents to do so. Seems I’m not alone. BTW, without the $100,000 per event speaking fee, how’s Al gonna’ come up with the alimony for Tipper? I don’t know if she’s high maintenance or not. I hope she didn’t get all of the carbon credits as a settlement in lieu of cash. Wow, no more ice, Polar Bears will be floating in the North Atlantic like ice bergs……. It looks so bad I checked my frezzer to see if my “Scotch on the Rocks” ice was ok.
Is that 19,613 conferences at $100,000 each?? A rather obscure minor politician of the United States from the late twentieth century. Later attempted to rise out of obscurity during the early years of the twenty-first century by mobilizing a mass movement best described as quasi-religious with emphasis on weather. A number of scandals impacting other groups loosely related to his movement as well as his own control issues began to impact his movement. Ultimately, weather events did not conform to the movement’s revelations, resulting in a huge collapse in the membership rolls, except for a few hundred bitter, hard-core members. He later died alone of exposure and in obscurity in one of his mansions, after the solar panels failed after being covered by snow. Little else is known of him or of his briefly popular mass movement. The frequency of ‘news’ on the TCP site also appears to be undergoing a ‘catastrophic decline’, with only one item for each of the last two months. Perhaps it has reached its own personal tipping point? But Anthony, to link to WUWT from other sites, I would have to go to other (comment accepting) sites! What the point in that? There’s more than enough content right here! Arctic-ROOS has a glitch in their satellite readings. 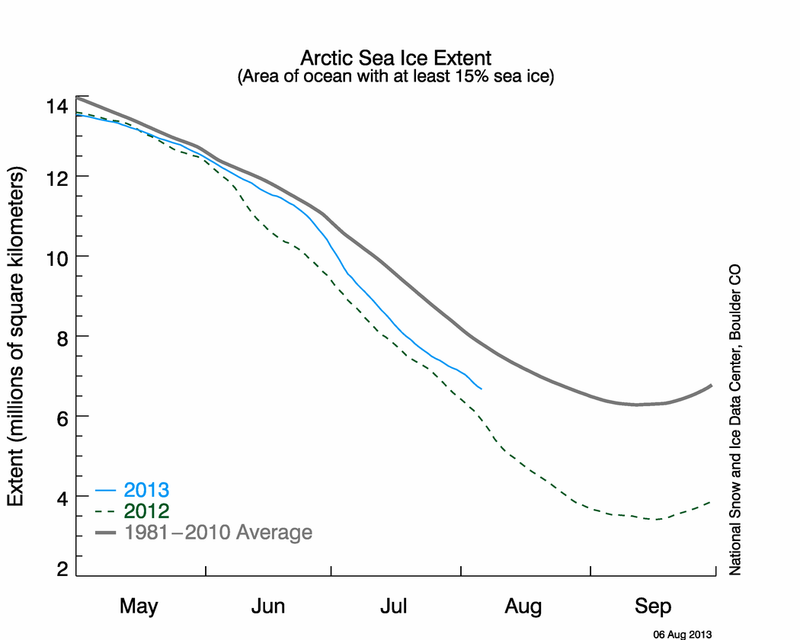 See the rest of other sites and see Arctic ice has started a strong upward curve. I hope the Arctic cold won’t reach the Southern Hemisphere where we cannot get rid of the winter yet! Maybe Gore just needs to get a karaoke machine? Make the entertainment more robust! Did they real call that program “Skyfall” ? Somebody call Chicken Licken; or izzat Chicken Little/ whatever ? In the UK, schools cannot show “An Inconvenient Truth” without informing the pupils that it’s a political piece and contains innacuracies, after a father went to the High Court complaining of brainwashing. Perhaps adults have eventually seen that these inconvenient truths also apply to speeches and presentations. Al baby, it’s worse than we thought!! Looks like Al is suffering from an inconvenient flop, as his political fortunes are tanking. I smell a Michael Moore moment coming on. One of the most common psychological responses to a discussion of climate change is scepticism. This may be a refusal to engage with the immensity of the challenge, or may simply be a response to much of the confusion that is created through often contradictory media reports. In March 2007. scepticism of climate change was fuelled by the Channel Four documentary The Great Global Warming Swindle. 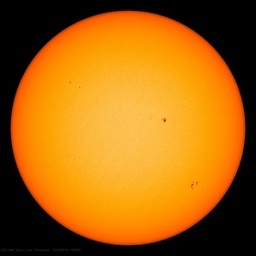 The evidence presented in that programme was strongly refuted by the scientific community, including the Met Office and Carl Wunsch, a scientist who was interviewed for the programme. He later said that the programme was “…an out-and-out propaganda piece, in which there is not even a gesture toward balance or explanation of why many of the extended inferences drawn in the film are not widely accepted by the scientific community”. There are a number of useful guides available online that seek to clarify and explain the scientific debate around climate change. The Royal Society has published Climate Change Controversies: A Simple Guide, which seeks to present an accurate account of the weight of scientific evidence. See also the New Scientist’s article, “Climate Change: A Guide for the Perplexed”. Grist, a not-for-profit environmental journalism portal, also features a comprehensive page on “Responses to the Most Common Skeptical Arguments on Global Warming”. The Met Office / New Scientist / Royal Society, eh? WTF? Further, there is a page allocated to ‘Materials and Resources’ which offers guidance to finding suitable information to enhance the ‘message’ and including a hotlink to – you’ve guessed – Gore’s TCP. “It is possible to organise screenings of Al Gore’s 2006 documentary An Inconvenient Truth and Franny Armstrong’s 2009 film The Age of Stupid to raise awareness about climate change. Aah, no thanks – ‘Pale Rider’ will do much better…. How can anyone not be sceptical given the obvious links between self-promotion and advocacy? The quicker this scam is dragged into the light, the better for all. Lol, but I think it’s too late to sell. At this time I think we should shout: Jump! Such is the fate of all fashionable faddish ideas like CAGW – they sound good, or disturbing, or somehow relevant and important; then nothing or not much happens and the public moves on to the next distraction. Can you blame them? After all; where is the heat; the flooding; the climate refugees…For a time there he really had everybody going. Actually AL’s movie tipped me from sarcastic comment to actual investigation of the professed science.When so many BS detectors go off at once and the local do gooders are all aghast about CO2 its time to check the facts. My conclusion is it is time to tax or physically attack any dogooder who is out to help/save me. Stupid is as stupid does indeed and they have done it all over the place on this scam. we will be tossing senseless bylaws, provincial laws and taxes for decades. I love the internet, Utube , future quote, my opponent is so stupid he/she bought into AWG. Question, can Al Gore be prosecuted for spreading lies for profit? If you thought big Al was steamed about attendance to his site, you should have heard him vent when he found out, most of his hits came from here every time WUWT mentioned the decline. So, would that make them “Goreites” (in emulation of Millerites? Looks like Big Al needs a new gig. Or better yet just fade away. Yes Al. The word you are looking for is “rumbled”. Because the death spiral of your website has been posted on WUWT I actually heard about your website and visited it! So that is at least one hit you got today! Am I the only person that thinks Al Gore might have lost some credibility buying a $9 million seaside home and owing a multimillion dollar seaside condo? Al Gore – who? Wasn’t there a VP by that name sometime back? He has a movie out? Oh! Is that the guy that has been wrong on so many issues that nobody pays any attention to him – anymore? including his wife? or ex-wife….?? or is that the current VP? Yeah, I visited once after a mention here. It was so bad I will never repeat the experience. i thought the “inconvenient truth” was his Infomercial!! Alexa graph x-axis: proudly brought to you in color by TCP! How will he afford that ocean front beach house? Guess he is going to have to file chapter 13. Poor soul. I think he should return all that money.Imagine all the DDT Africa could buy for it. I can’t complain about Mr. Gore – he made me sceptical and brought us Man-Bear-Pig. You know, if I squint real hard at the “skyfall” graph, I can almost see a hockey stick! Maybe they are using the wrong Al Gore-ithm. Is that a 4/3 beat?